Use promo code jconnect to get half off. Daniel Kahn & The Painted Bird (Berlin) take Seattle by storm for the first time, in celebration of their new album, The Butcher's Share. Headed by viral sensation punk Yiddishist, actor, and singer songwriter Daniel Kahn--known as much for viral Yiddish version of Leonard Cohen's "Hallelujah" as for his role in Broadway-bound, Yiddish language reboot of Fiddler on the Roof--their new album is garnering rave reviews from the Yiddish world and abroad, selling out multiple East Coast debuts. 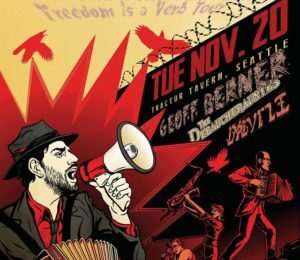 The Seattle stop is a lineup for the ages: supported by Kahn's longtime friend, legendary "whisky rabbi" Geoff Berner (Vancouver), it also includes Seattle pillars of the PNW klezmer and Yiddish scene with the neo-vaudevillian carnival flair, The Debaucherauntes, and local up and coming Yiddishist antifascist folkpunk trio with incredible harmony, Brivele, for an incredible once in a lifetime night not to be missed.